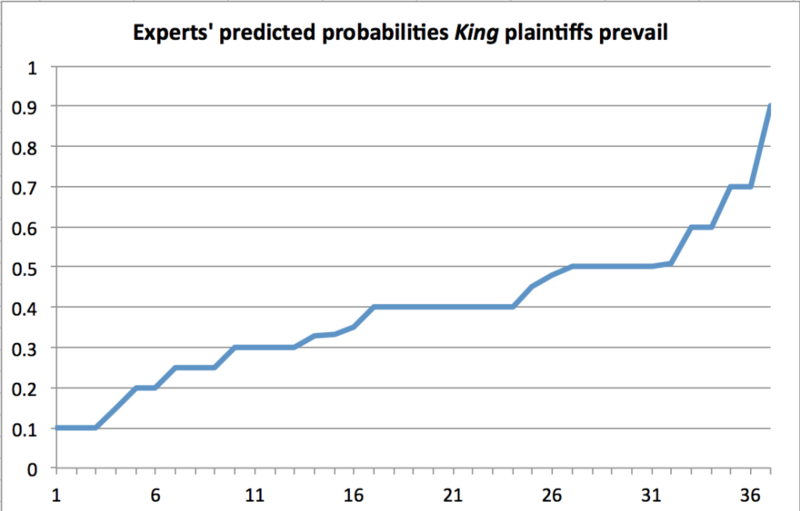 The week before King v. Burwell was announced, I confidentially polled an elite group of health policy and legal experts to get their personally-assessed prior probability that the King plaintiffs challenging ACA subsidies would actually win this case. The somewhat-arbitrary group included leading health economists, political scientists, journalists covering the case. It also included several legal antagonists who had written briefs on the various sides. I received more than forty responses. Not surprisingly, given my own liberal views, about three-quarters of the responses were from Democrats. Although Democrats and Republicans had wildly different views of who should win, the distribution of predicted probabilities of a plaintiff victory was surprisingly similar between the two groups. Amazingly, Catoâ€™s Michael Cannon and I offered identical prior predictionsâ€”20% probability of plaintiff victory. Among Democrats, the median predicted probability of plaintiff victory was 40%. Among Republicans, the median was 37.5%. The means showed a bit more of a difference between the two groups: 46% among Republicans, 37.5% among Democrats. Yet five of the six highest predicted probabilities of a plaintiff victory came from Democratic experts; two were 70% or higher. The overall distribution is shown below. Judging by my admittedly- clunky informal poll, the Obama administrationâ€™s emphatic victory surprised many close observers on both sides. Many Democrats reported that the plaintiffs had more than 0.5 probability of winning. Otherwise, why would the Supreme Court have jumped to take the case? We may never know the answer to that question. We donâ€™t merely know this from polls. Hospital Corporation of America stock rose 8% at the decisionâ€™s announcement. (See below from WSJ.com.) That is an amazing jump, which reflects hospitalsâ€™ strong stake in ACA’s effective national implementation. Many states went to considerable trouble devising contingency plans, suggesting that they, too, took this case very seriously indeed. After the ruling was announced, I tweeted that conservatives magnified their political and legal losses by tethering themselves to a preposterous legal case. I stand by that deep, 140-character argument. Yet it is definitely an ex post argument. The smart money believed that the plaintiffs might well have won. Weâ€™re likely to see a huge amount of hindsight bias applied to this case. From the plaintiffâ€™s perspective, this seems ex post like a more doomed tactical gambit than it actually was, when properly viewed from anÂ ex ante perspective.Â From my opposing perspective, this is sobering. Fortunately, the same insights make the governmentâ€™s emphatic victory appear more exhilarating and important than it would otherwise seem to be. Your results — with Democrats more inclined to predict a pro-plaintiff decision than Republican experts were — may reflect a mindset we on the lefty side have gradually developed in recent years: resigned acceptance of the fact that GOP judges are far, far more politically motivated than once was the case, or indeed had EVER been the case before. We've seen so many instances in recent years of conservative judges (and other officials), at all levels, barely even bothering to cloak their political intentions. We've watched with both horror and a certain sense of helplessness as starkly perverse (and brazenly partisan) new interpretations of the constitution and long-established federal laws are trotted out by minions of The Federalist Society, and rapidly introduced as new precedent in courtrooms up and down the system. After awhile the shocking thing is when we see a Republican-appointed judge actually just uphold long-established legal tradition when tossing out yet another weirdly-twisted conservative legal initiative. I think the King vs. Burwell decision was absolutely correctly decided on the merits; a "scrivener's error" should not dictate the fate of an entire law. But like many of your other experts — having lived through Bush vs. Gore — I had little confidence that any of the Court's conservatives could be counted on to do the right thing. And indeed, even now we don't know but that Roberts and Kennedy did the right thing for entirely wrong reasons. For all we know, one or both voted as they did not on the merits of the case, but on a rising panic among major GOP interests, most particularly an enormous health insurance industry that has spent billions re-gearing itself to live with Obamacare and would have been seriously hurt by a decision for the plaintiffs. The post-decision jump in HCA stock suggests that the market had priced in a substantial probability of a plaintiff victory. Politically, though, this would have almost certain been a Pyrrhic victory. Millions of people suddenly denied subsidies would have been strongly inclined to vote for the Democrats. From a realist perspective both Supreme Court decisions (healthcare and gay marriage) are excellent news for the Republicans. Nice little study Harold. And I am proud to have been at the left end of your line. I publicly tweeted my prediction (40% King win), 50 clean government win, 10% procedural government win). Looking just at the arguments, it was a no-brainer government win. I was hedging hard that the Supreme Court is nakedly and explicitly partisan first and foremost and not a legal body, which given the span of my adult life is not too radical of a position to take. It was not an assessment of the argument, it was an assessment of the Supreme Court as an institution. There's no such thing as "the distribution of predicted probabilities."